Guinea, Sierra Leone and Liberia have been worst hit by the Ebola outbreak. More than 5,400 people have died in those three countries, along with a handful of others in Nigeria, Mali, Spain and the US. The deadly Ebola outbreak can be ended "by the middle of next year" if the world speeds up its response, UN Secretary General Ban Ki-moon has said. But he warned that although the rate of new cases was slowing in parts of West Africa, Mali - where six people have died - was now of deep concern. And the head of the UN Ebola mission, Anthony Banbury, said the world was "far away" from beating the virus. In a separate development, Liberian police said all the country's beaches would be closed from 29 November until Liberia was declared free of Ebola. In a statement, the police said anyone using the beach in violation of the order would be prosecuted. Speaking at a meeting in Washington with officials from the World Health Organization (WHO), World Bank and the International Monetary Fund (IMF), Mr Ban said: "If we continue to accelerate our response, we can contain and end the outbreak by the middle of next year." He said that so far results in the international effort to tackle Ebola remained uneven, stressing that many more health workers were needed in the worst-hit countries in West Africa. "Our end game is not near. We must get to zero cases. Ebola is not a disease where you can leave a few cases and say you've done enough." Mr Ban said the situation in Mali was of particular concern. 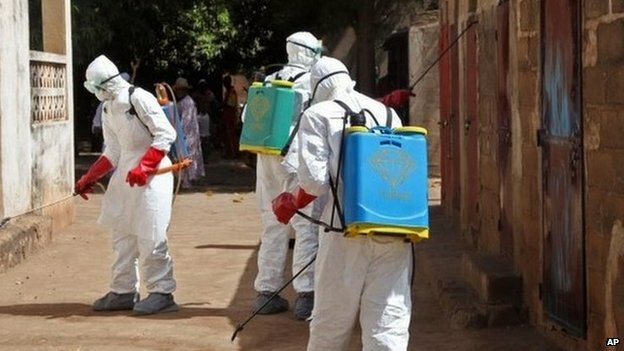 WHO chief Margaret Chan is to travel to Mali later on Saturday, and the UN has already announced a special taskforce for the country to deal with the outbreak. Mr Banbury, the head of the UN Mission for Ebola Emergency Response (Unmeer), warned that "we are far, far away from ending this crisis". "There is a long battle ahead of us," he added. The UN's comments came as a doctor in Mali died after treating a patient who had sparked a second Ebola wave in the country. The doctor, whose name has not been released, had worked in a clinic in the capital Bamako where an Islamic preacher from Guinea was admitted last month. Preacher Oussa Koita was initially diagnosed with a kidney problem and has since died, along with another health worker. A two-year-old girl also died from Ebola in Mali last month in a separate case, which did not lead to any further infections. Nearly 500 people are currently under surveillance in Mali, the authorities there say. Ebola is spread only through direct contact with the bodily fluids of an infected person showing symptoms, such as fever or vomiting. People caring for the sick or handling the bodies of people infected Ebola are therefore especially vulnerable.